Celeb Gossip News – North Korea Seeks to Split Alliance Between South Korea and U.S.
North Korea Seeks to Split Alliance Between South Korea and U.S.
SEOUL, South Korea — North Korea on Saturday escalated its attempt to create a rift between South Korea and the United States, as Washington sent mixed signals over whether it would tighten or relax sanctions on the North. Ever since the summit meeting between the North’s leader, Kim Jong-un, and President Trump in Hanoi, Vietnam, late last month abruptly ended without a deal, North Korea has ceaselessly urged South Korea to distance itself from the United States and to push ahead with joint economic projects that have been held back by American-led United Nations sanctions. North Korea’s official trade has been devastated by international sanctions imposed since 2016. The country has tried to circumvent them by importing refined fuel or exporting coal through ship-to-ship transfers on the high seas, a move banned under United Nations sanctions. It has also sought to undermine the sanctions by boosting economic cooperation with South Korea. President Moon Jae-in of South Korea remains eager to boost inter-Korean economic ties, raising fears at home and abroad that he may steer his government away from international efforts to enforce sanctions against the North. But in reality, Mr. Moon’s hands are tied unless the United States and North Korea reach an agreement on denuclearizing the North and Washington helps to ease sanctions. Mr. Moon suffered another slap in the face when the North abruptly withdrew its staff from a joint inter-Korean liaison office on Friday. Mr. Moon has dedicated his diplomatic resources to facilitating dialogue between Washington and Pyongyang, and has promoted building peace on the Korean Peninsula as his main policy goal. But his mediator’s role has run into a wall since the breakdown of the Hanoi meeting between Mr. Trump and Mr. Kim. He faced accusations that he had oversold Mr. Trump on Mr. Kim’s willingness to give up his nuclear weapons, even as North Korea accused him of working on behalf of Washington. But Mr. Moon remains determined to keep the momentum for diplomacy alive. The Hanoi summit meeting broke down when Mr. Kim insisted that the most punishing United Nations sanctions against his country should be lifted in return for a partial dismantlement of his country’s nuclear program. Before the Hanoi meeting, analysts had feared that Mr. Trump might sign onto a partial denuclearization deal and claim it as a victory. But in the end, he listened to his aides’ advice and walked away without signing a deal. After the Hanoi meeting, Mr. Trump has continued to reaffirm his good relationship with Mr. Kim and his willingness to make a deal. But the American president’s aides remain firm against lifting sanctions, arguing that it would deprive Washington of its most powerful tool to force North Korea’s complete denuclearization. On Thursday, the United States Treasury Department demonstrated Washington’s determination to keep squeezing the North by designating for punitive measures two Chinese shipping companies that had helped North Korea evade sanctions through deceptive methods like ship-to-ship transfers of cargo. South Korea was thrown into confusion after Mr. Trump tweeted that he ordered his government on Friday to withdraw “additional large scale sanctions” against the North. The tweet was initially taken as overruling the Treasury’s announcement the day before. But United States officials later explained that Mr. Trump had been referring to additional North Korea sanctions that were under consideration but not yet formally issued. “President Trump likes Chairman Kim, and he doesn’t think these sanctions will be necessary,” Sarah Huckabee Sanders, the White House press secretary, told reporters. 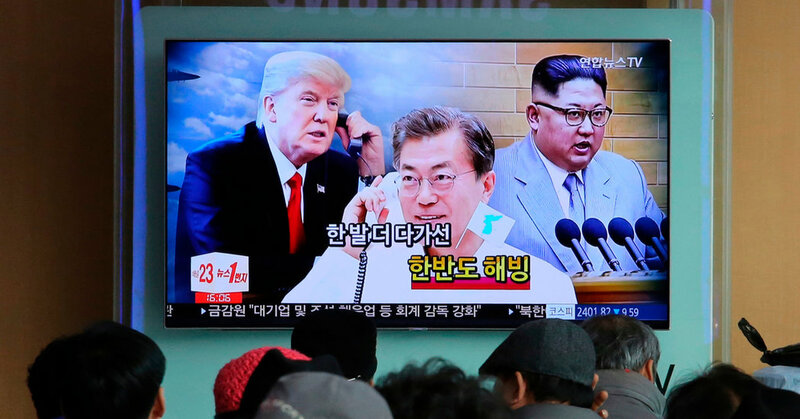 “By withdrawing additional sanctions against North Korea, President Trump showed his firm will to continue dialogue to realize the denuclearization of North Korea,” Lee Hae-sik, a spokesman of Mr. Moon’s governing Democratic Party, told reporters on Saturday. But the main opposition Liberty Korea Party said that Mr. Moon has been used as “a pawn” by Mr. Kim and had ended up creating a fission in the alliance with Washington. “President Moon Jae-in and his Blue House still don’t grasp the reality and have a delusional belief that he is a mediator or facilitator,” Jun Hee-kyung, a spokeswoman for the opposition party, said in a statement. By dropping North Korea-related sanctions, Mr. Trump was trying to defuse growing tensions between Washington and Pyongyang after the Hanoi breakdown, said Harry J. Kazianis, director of Korean studies at the Washington-based Center for the National Interest. Recently, Vice Foreign Minister Choe Son-hui of North Korea threatened to suspend negotiations with Washington and said that Mr. Kim would soon decide whether to resume nuclear and missile tests, which it has not carried out in more than a year. “Trump’s canceling out of sanctions might have been a bid to get North Korea to change its thinking,” Mr. Kazianis said. Alliance, between, Korea, North, seeks, South, split, U.S.